Pop music doesn't have a lot of star cello players. There's ...um... you know... there's that one... okay, we'll come back to that. Let's just say it isn't the usual instrument that's featured first and foremost down at the club on Saturday. However, the East Coast can lay claim to somebody who's been working on that for awhile, and has just made their first solo disc, with an eye towards changing perceptions. Now, this isn't a new artist, and I was confused at first. I picked up the disc by Anne Janelle, and was told in the press release she was from the Maritimes, but that was a new name to me. Then I found out it was none other than Anne Davison. That name I know, and she's well known in both the Canadian classical and folk world. Davison moved to Nova Scotia in 2007, already an established artist, and one with a big difference. Rather than work in orchestras or quartets, which she could easily do, she has been stretching the boundaries of where she could go. First off, she's also a singer and songwriter, and has insisted on having the cello as her main axe for that writing side. And although there have certainly been classical elements in her work, there's just as much and more from lots of other influences. I'd hesitate to place it in any genre really, other than musical performance with vocals. It all depends on where she wants to take her songs. Quite successfully she took it to folk music, where she teamed up with another free spirit, one James Hill. The B.C. native does for the ukelele what Davison does for the cello, taking it to surprising places, and he's become known as one of the world's top players with that instrument. Together these two iconoclasts made the 2009 album True Love Don't Weep, which won a Canadian Folk Music Award for Traditional album of the year. So, this seemed like a collaboration to keep going. Except, it didn't turn out that way. When they began recording the followup album, it became clear they had both come in a parcel of strong, individual tunes. So rather than force the issue, they simply made two discs, as solo projects. That's why the Anne Janelle name, to distinguish this new phase of her career. They didn't end the partnership; Hill co-produced, co-wrote, and played all over the new disc, called Beauty Remains. It's just not the same thing the duo did before. This time, Janelle goes all over the map, from ballads to jazz to folk to bluegrass to avant-garde. But one thing remains constant, and that's her song writing and singing, working with beautiful melodies. I think that's the key to this unique performer. 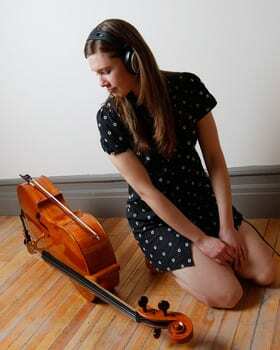 While she could just play cello, the song writing lets her explore the other side. And since the songs are written from the cellist's point-of-view, they have a different sound. They aren't cluttered with lots of instruments, but rather have lots of room for the cello notes to ring with the rich tone in between notes. She also moves her vocals around the notes, creating a melody different from the cello business. Some of the works are sparse, others get more strings and horns, piano and drums, but you can always find that cello line meeting the melody. I love the music and production, the crystal-clear sound is filled with warmth. She's not my favourite singer, a find her voice a little too sweet, but perhaps that's the influence of my years with rock ears. Hey, Anne Janelle wants to change that kind of perception. Welcome to the cello-pop genre.